Is there a link between good quality public transport and car ownership rates? 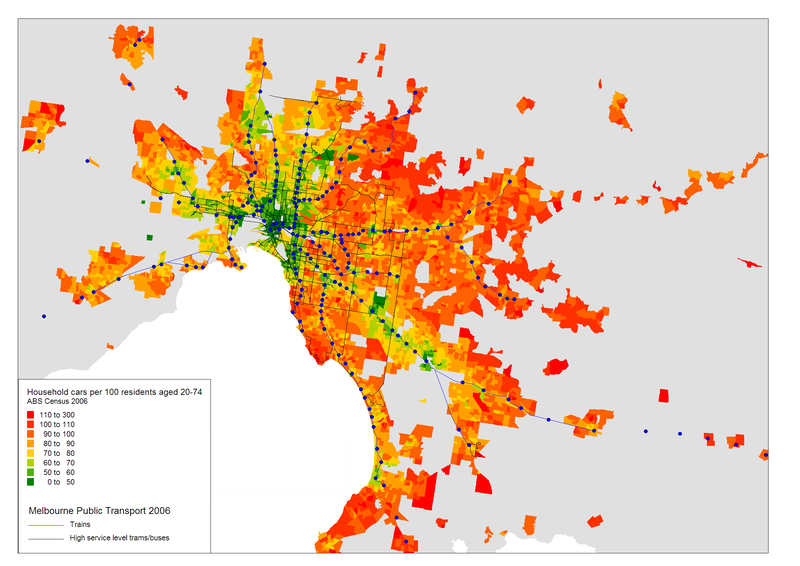 Will high density urban develop around good quality public transport lead to significant increases in car ownership? Obviously not a new topic, but in this post I hope to at least illuminate the state of play in Melbourne (as per the 2006 census). The Australian Census provides very detailed data on car ownership to a high resolution. The data includes the number of 0, 1, 2, 3 and 4 or more car households in each Census Collection District (which average around 225 dwellings). Most spatial representations of car ownership show the number of households with 0,1,2,3, or 4 or more cars. This is fine, except it ignores household size. Single occupant households are unlikely to have 3 cars, while large family households with grown up children are more likely to have 4 cars. Rather than cars per household, I’ve used cars per 100 adults for an area (I define “adults” below). This removes household size from the equation. Essentially what I did was add up the number of reported cars in each CCD, which for 0,1,2 and 3 car households is straight forward. 5.1% of households in Victoria reported “4 or more” motor vehicles and a further 3.7% did not specify the number of motor vehicles. In the absence of more detailed information, I have assumed an average of 4.2 motor vehicles for households reporting “4 or more” and zero motor vehicles present where households did not respond. While this means there is a small level of uncertainty as to the actual total number of motor vehicles in each census collection district, these represent small percentages of the total, and it is still possible to compare relative levels of car ownership between areas. Hence I refer to the car ownership rates as estimate. I divide the number of cars by the number of “adults” – ie people who are generally of driving age. As the census reports age in 5 year blocks, I’ve used 20-74 as the age range where most people would be eligible and confident to obtain a drivers license. This is fairly arbitrary I agree. People under 20 can drive and own cars, as can those over 74, but they are perhaps less likely to do so. So the calculations are not an exact science, but give a pretty good idea of the car ownership rates for different areas. It also allows me to show car ownership rates on a single map, rather than the need for multiple maps. In the maps below I have only shown urban areas that come within a minimum urban residential density, so the boundaries between urban and regional areas are clearer. Superimposed on the map are high quality public transport routes that existed in Melbourne in 2006. I’ve used all train lines (stations are marked), all tram routes, and selected bus routes with “high” service levels – reasonable frequency and long span (at most a 16 minute headway on weekdays inter-peak). It’s hard to define a perfect threshold for bus routes as some have good frequency but poor span of hours in 2006. Again not a perfect science. Here are the maps for greater Melbourne and inner Melbourne (click on them for higher resolution – you may need to click again to zoom in). Where there is a dense grid of high quality public transport – ie you can catch public transport in multiple directions relatively easily to get to a range of destinations. This includes areas where the high frequency transport is provided by buses and not trams (eg the Footscray to Sunshine Corridor). Areas of higher income generally have higher car ownership. 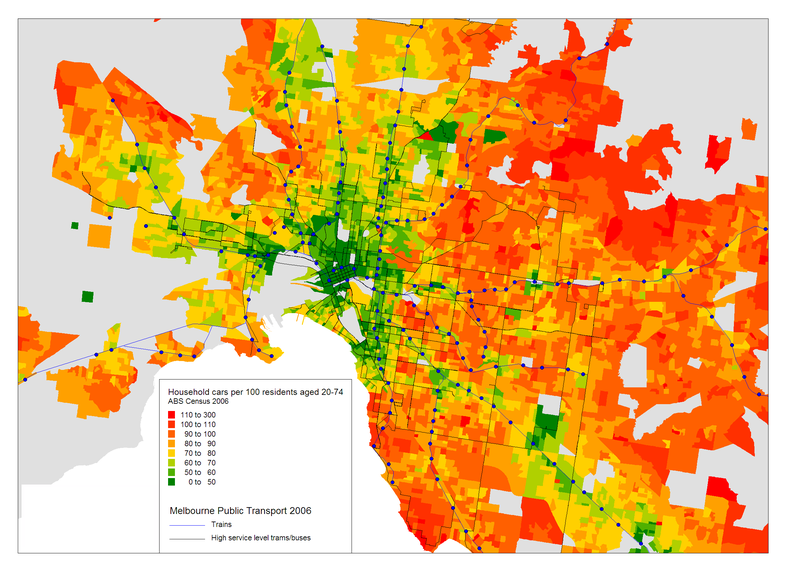 Higher than local trend car ownership can be seen in areas like (west) Kew, Toorak, Brighton and Greenvale. Note that this exercise does not aim to fully explain the reason for rates of car ownership in Melbourne. There is extensive literature available about this subject. We have primarily set out to highlight car ownership rates in Melbourne to inform debate. The maps show low levels of car ownership in many places where there is a dense network of high quality public transport. That suggest that high frequency public transport routes operating from early to late in multiple directions is an enabler for people to choose not to own a car. Increasing population in areas with dense networks of high quality public transport is therefore less likely to result in high levels of car ownership and use. The tram network provides the radial links in most cases, while bus routes are needed to provide links across the tram routes. By upgrading a few more inner city bus routes, a larger area could support higher populations with low car ownership rates and high liveability. Even those people who do bring cars with them will probably leave them parked most of the time as walking, cycling or public transport will be an easier option for most trips. High rates of car ownership do not necessarily translate into high rates of car use. This analysis was the subject a media story in The Age, in November 2009. This entry was posted on Sunday, January 17th, 2010 at 6:53 pm and is filed under Car ownership, Melbourne, Urban Planning. You can follow any responses to this entry through the RSS 2.0 feed. You can leave a response, or trackback from your own site. Your last point is important. I’d suggest people buy cars generally for the status of having one, and then decide how much to use them based on the convenience of the alternative. The only exception being those too young or poor to afford them, who postpone the decision as long as they can, and if the alternatives are poor, then do their best to acquire one. I don’t know if planners can deter household car ownership, but they might deter individual car ownership (by postponing the acquistion by young or poor) through convenient alternatives.